Give the gift of heat any day of the year! Our hot sauce gift box is perfect for anyone who is up for trying something new. Choose between our pre-made boxes or pick your own combo! 4 awesome boxes to choose from! Great Brands to choose from! The best e-commerce build your own hot sauce gift box is here at Flower City Flavor Company! Don’t let someone else choose your flavor! We have over 60 selections of hot sauce to choose from. From mild and mediums to 1 million plus Scoville unit hot sauces, the combinations are endless. Warning! This hot sauce gift box is not for the faint of heart. Only sauces from our heat level 8, 9 and 10’s appear here! 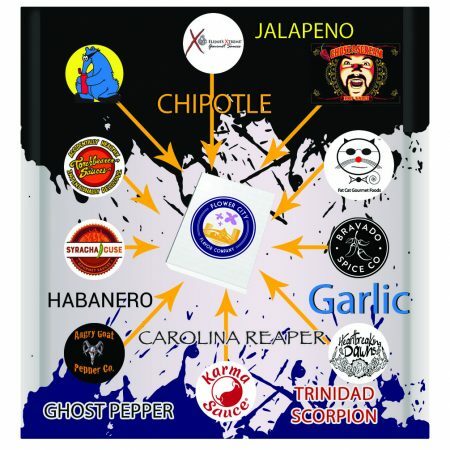 Create your own extreme heat hot sauce box and get your milk ready as you’ll get not only an intense blast of flavor but heat to go along with it. Ghost Pepper? Check. Trinidad Scorpion? Check. Carolina Reaper? Checkmate. Don’t say we didn’t warn you! Rochester, NY, our company’s hometown, is lucky to have not one but two nationally recognized, award winning hot sauce manufacturers right here from the Flower City, Karma Sauce and PepperNutz! Now for the first time, you can get them together in this new create your own Flower City Flavor Rochester Hot Sauce Box. Choose any combo of 3 and give both the gift of Rochester! Can’t decide on what you want? Do you live on the adventurous side? The Surprise Me! hot sauce box is perfect for those who are up for anything but can’t decide on what to get! It’s simple: you buy the box and we bring the flavor. We can’t tell you what you’ll get except that you’ll get three great hot sauces at a fixed price of $26.97, which could save you up three dollars!